This pattern creates a strong band of tension along the base of the head that comes up over the back of the head. It comes from the semispinalis cervicis muscle. 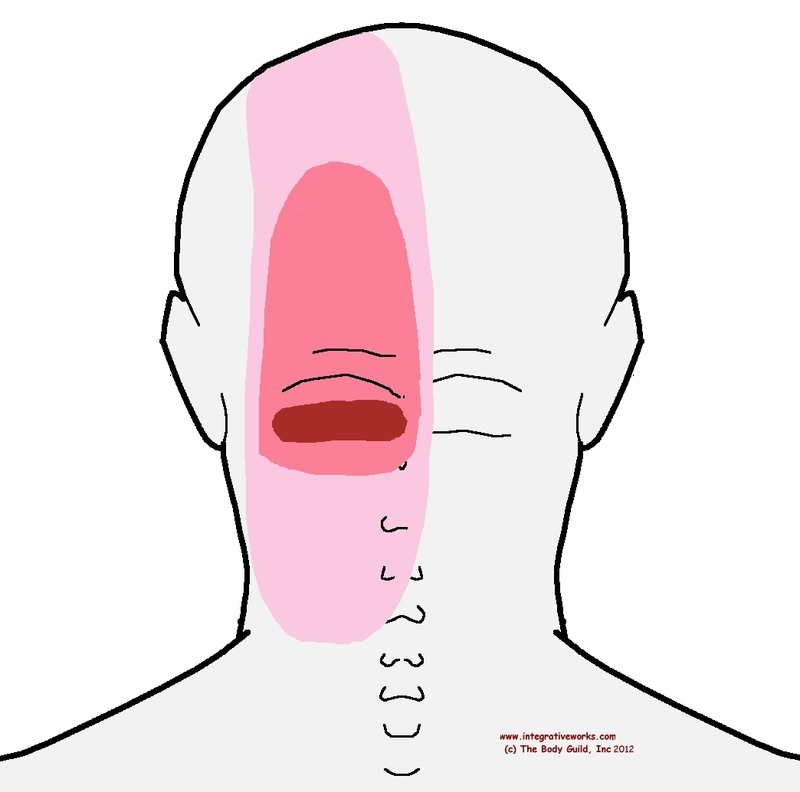 When it is only active on one side the pain is focused at the base of the head and creates tension that mostly radiates up the back of the head. When I have this headache, it is usually only a few minutes of joint work and stretching until it is gone. The client comes in complaining of a headache at the base of their head. They may continue to say that it is really more of a neck ache that extends up into their head. It is usually dull and miserable instead of being sharp and blinding. If I ask further, they complain about it coming up over their head toward the front. It is even worse when you prop your chin in your hand. After you get up from the computer, this muscle continues to pull down on the back of the head creating “Forward Head Posture.” When your head sits in front of your shoulders, muscles in the back of the neck strain to pull it back. Before computers and mobile phones, this posture was mostly a problem in counselors who craned their neck to empathize. The Ice and Stretch routine is great for temporary relief and working on lasting changes. Icing the upper neck from ear to ear and tilting your head forward 3-4 times will often create quick relief but not lasting relief. Having a therapist guide you through a good stretching routine can really help change Forward Head Posture. It will be easier to break postures that perpetuate this problem once the muscles are lengthened and balanced with stretching and bodywork. Most bodywork therapists are trained to understand Forward Head Posture and how to loosen the muscles that wedge the atlas forward. This is almost always relieved when atlas is mobilized. That can be done with a number of techniques including cranial, intra-oral and anterior cervical NMT. Stretching and other techniques can be used to stabilize the musculature around the upper cervicals and prevent the atlas from being wedged forward again. Lengthening the scalenes and other musculature in the lower anterior cervicals allows the base of the neck to support the correction of forward head posture.